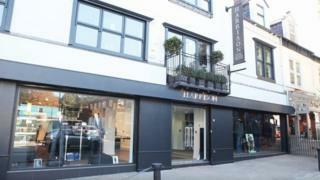 A designer menswear shop is closing down after being targeted by robbers six times in four months. Harrison, in Sheffield, stocks brands including Paul Smith, Hugo Boss, and streetwear brand Stone Island - popularised by rapper Drake. It has been broken into four times and been ram-raided twice since December. Owner John Harrison, who opened the shop in 1987, said he could no longer cope with the "continued emotional turmoil and financial loss". The store, on Ecclesall Road, is set to close on Sunday. "Some of the coats we are selling are around the £800-£1,000 mark," Mr Harrison said. "Most of the high-end brands that we stock have unfortunately been stolen, we are at the closing days of what stock we've got left. "It's madness, how we have been targeted so many times, it's unbelievable." The latest attack took place on 14 March, when ram-raiders broke through the shutters and stole clothing. Mr Harrison said: "Since 8th December we have had six serious robberies, one which was cutting a massive hole in the building - it has just been incessant and enough is enough really. "We feel we just can't continue under those pressures." He has urged anyone with information about the robberies to contact police.